Yes I still have a ton of pictures to post, but overall this was in my opinion the best Emerald City Comic Con of them all to date. The cool part is that next year is year 10, the 10th year anniversary of the show, so expect blow out crowds again, and make sure you get tickets for 2014 early. For the first time that we know of all three days were sold out, which added to the insanity that was this last weekend. 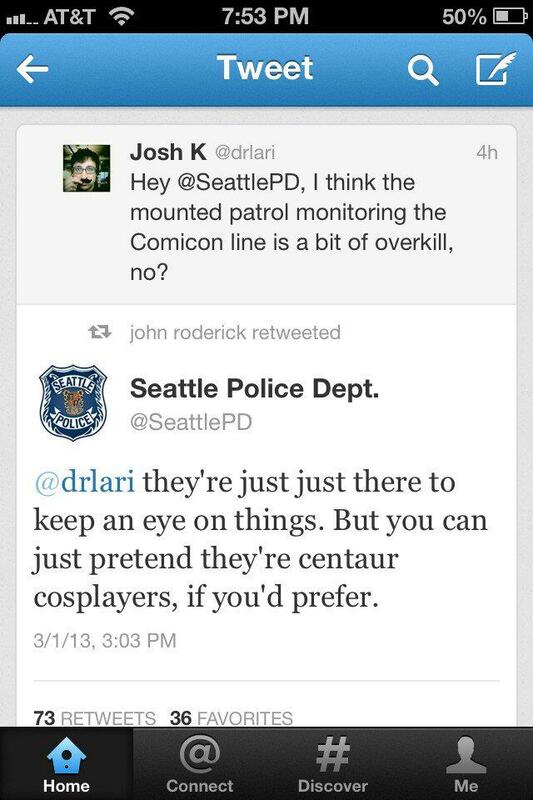 Even the Seattle Police Department showed its sense of humor over the weekend by asking people to pretend that the police on horses were centaurs in cosplay. As we all bask in the afterglow of the show, and are probably taking Motrin because of the miles walked around the show all weekend long it is a good time to sit back and go over just how amazingly cool this whole thing was. The best part is that FlipON.tv was recording the whole show, so if you want to go capture the glory, or see if they got you on TV, head on over there and check it out. It was also good to see Valliant Comics there, and Zenescope. Valliant was the first comic book series I started with back in the 1980’s, so it was awesome to sit down and talk to their reps. I am hoping that they will do an interview in the future with us, so come on Valliant, reach out and over. Zenescope was there with their two exclusive covers which we will be putting up for sale, along with some awesome bennies that they let us have along the way, so check out the store in the next week, you will get some awesome Zenescope stuff! Big Shout Out to Justin Zimmerman over at Bricker Down Productions for some new awesome comics, and his new partner over at A Wave Blue World for the comic “American Terrorist” which we will be reviewing this week. A big boo to the scalpers and the forgers, hey just remember both sides of the pass next time you decide you want to forge three day passes for the show. If you bought a three day pass from the forgers and scalpers, idiot. A big shout out to all the ECCC Minions, you folks were awesome all weekend, and we were glad we could hook some of you up with toys and books you wanted to have. Feel free to come visit us next year because we will hook you up with what we have when you are looking for it. A huge shout out to the guy who came by at 4:58PM, 2 minutes before show close and bought the “Oh my Goodness Doctor Who box” for your kids, I hope they are having a blast with that puppy this morning. Really, you could not have a better show, and as we get the pictures up, we will so post them here. But as always the real world intrudes, and ECCC is just one weekend out of the year. See you all next year!